Today’s Pedal Line Friday submission is from Coe Schneider. If you have a pedal line (doesn’t have to be in a board) for your rig, please email me a photo, bio, description of pedals and routing to pedalline@nulleffectsbay.com. Every Friday I’ll showcase a pedal line submission. Make sure you include any links to your band or music page. This is my current rig, I use this mostly for bass, but sometimes it doubles as my guitar rig, just not a lot of guitar gigs these days. The board is a Salvage Custom bourbon burst powered underneath by a VooDoo Labs supply. First place my signal goes is my old faithful Boss TU-2, call me old fashioned but I’ve always just ran thru it, never put off an aux on a volume pedal. From there we’re hitting the Retro Mechanical Labs Clean Over Drivr, I use it as a light, on the edge of breakup drive. I can really get some aggressive drive when I dig in with a pick, or keep it full and articulate with my fingers, this pedal is always on. Next is the Pelican Noise Works Pelitaur, because everyone needs a klone on their board. This pedal is actually the anti-klone as it is a crazy double fuzz pedal with very unique controls and sound. The Pelitaur is followed by the Push+Pull volume pedal, the one I have is one of the prototype models and I am not sure if they have a special name for them yet. The foot print is perfect for a smaller board like this and it’s very comfortable to use, great for making the swells. That feeds into the Pigtronix Tremvelope. I wanted a tremolo that would ramp up(or down) the speed based on pick attack, this pedal does that and offers a lot of other controls that come in handy from time to time. And then we get into the JHS Superbolt, a pedal I mostly employ when playing guitar but also comes in handy with bass to thicken the sound if I’m playing with a single guitar player when they need to take a lead line or solo. And finally we get to the Seymour Duncan Deja Vu. A super versatile tap delay, gets me clean digital repeats when I need it, or modulated analog sounds when it calls for it. 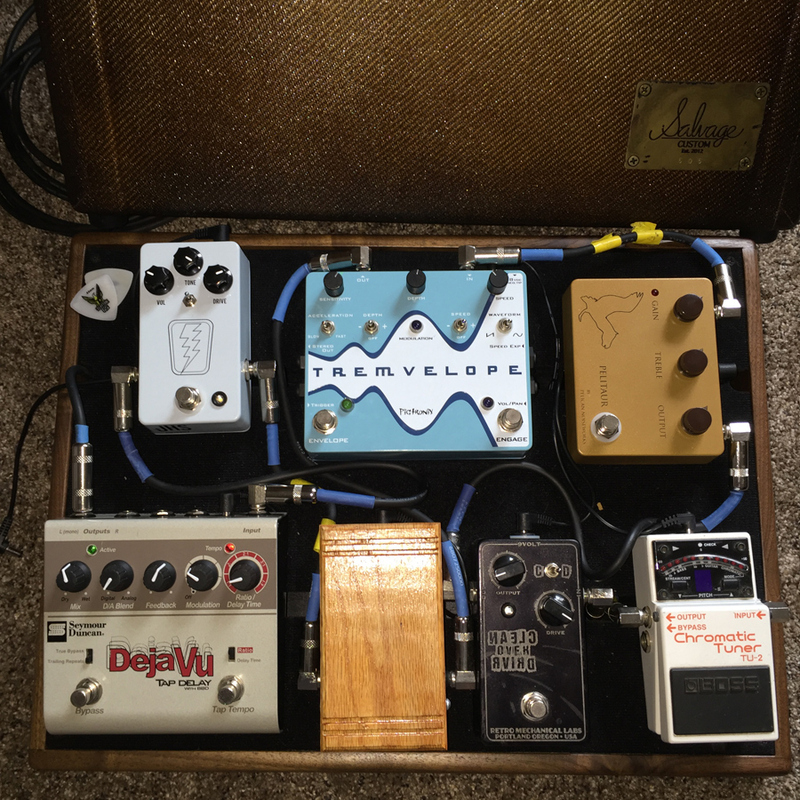 I leave an extra power supply plug hanging out the top of the board for the times I want to put something in the effects loop of the Deja Vu, an amazing feature that sold me on the pedal immediately.